In the Inland Revenue Service, we define Revenue Cycle Management as the ability to effectively follow the flow of money in the system from enumeration to cash-in-bank. Revenue optimization requires that the flow of money in the business be monitored in order to block leakages and ultimately increase collections. The CICOD suite of systems enables better processes with improved efficiency. The Inland Revenue Service assesses, collects and accounts for tax and other revenues accrued to the Local, State or Federal Government. The Revenue Service ensures the citizenry pay taxes as and when due to avoid penalties and sanctions for non-compliance. The major challenge faced by the Revenue Service is the leakages caused by inefficiency of manual processes. This can be resolved by automating and monitoring the revenue related processes within the organization through our CICOD solutions. 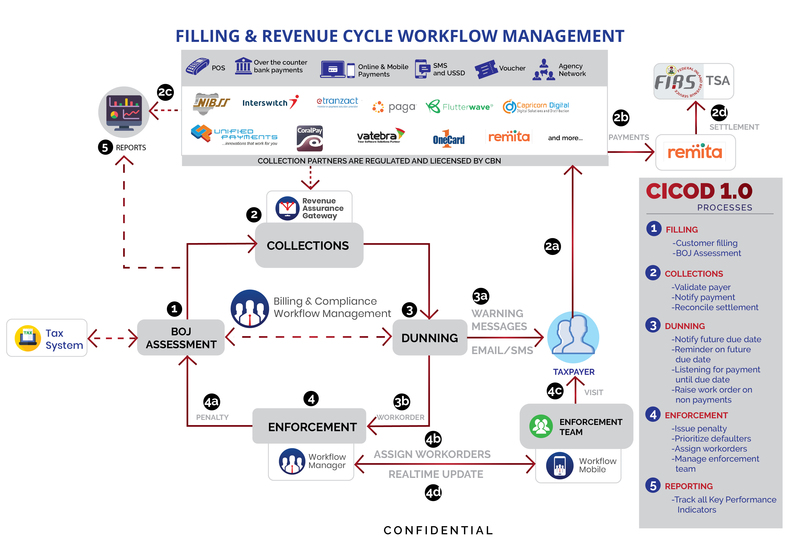 The CICOD Filing & Revenue Assurance Workflow Management automates the end-to-end processes involved in filing and collection of tax returns. 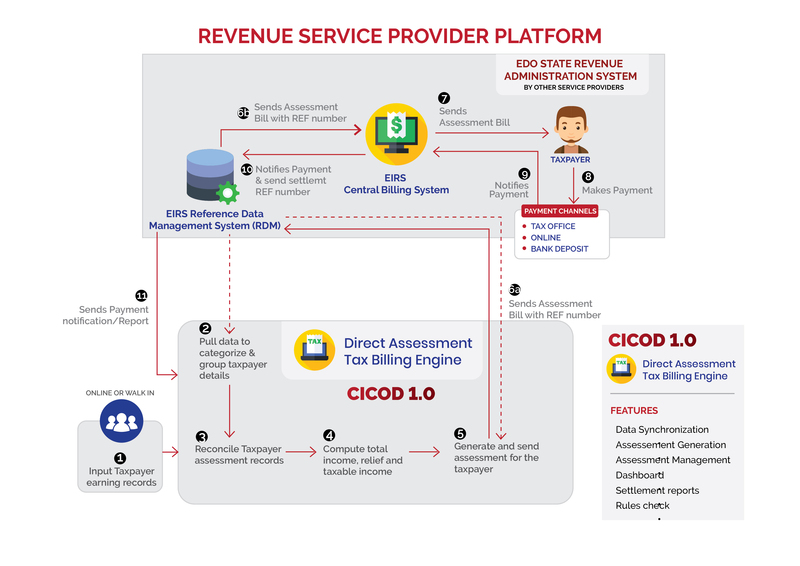 The CICOD 1.0 Billing system automates the filing of Tax payers returns based on assessment of their declarations or the output of a Best of Judgement (BOJ) assessment. Penalties can also be applied for defaulters on tax payment. Dunning of tax return payments to tax payers are done periodically until payment is made. In the case where a tax payer defaults on tax payment, a work order is raised on the Workflow Manager. The work order raised for defaulters are assigned to the Enforcement team to carry out due diligence. These work orders can be tracked and updated real-time. Unresolved work orders are then escalated for penalty fees to be applied. The Billing system sends the expected generated returns to the Revenue Assurance Gateway to generate Payment Order IDs. The generated Payment Order IDs is sent to the Billing System so that payment invoices can be sent to the tax payers for payment of tax returns. On successful tax payment, the Billing System is notified and the necessary settlements to the service’s bank account and payment partner are executed based on the Service Level Agreements (SLAs) via the integration with Remita. The service can also make real-time settlements to their Treasury Single Account (TSA). Reports on collections are generated real-time. A dashboard view gives real-time data on all processes. Reports are generated and key performance indicators are defined to enable the service make strategic and operational decisions and identify areas of improvement. 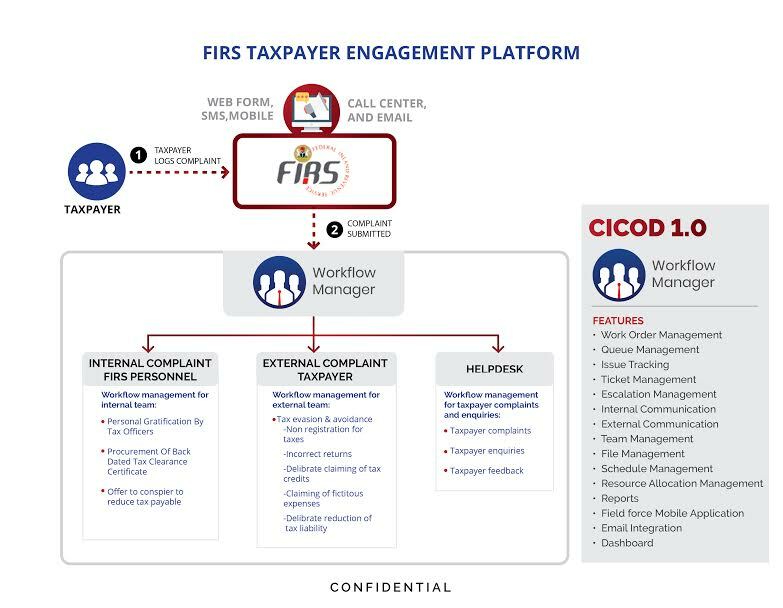 The CICOD 1.0 Workflow Manager system can be adapted as a Taxpayer Engagement Platform for the automation of Compliance Monitoring as well as Helpdesk Management. They provide a seamless mechanism for infraction reporting, complaints lodging, issue tracking, escalations of unresolved issues based on Service Level Agreements (SLAs) and reporting on Key Performance Indicator (KPIs). Government regulatory agencies are public industry-specific regulatory organizations mandated to regulate and monitor the activities of their respective industries. Examples are, the Central Bank of Nigeria for the Banking industry, Nigerian Communication Company for the Telecommunication industry, National Civil Aviation Authority for the Aviation industry and so on. These organizations are charged with the responsibility of issuing regulations and policies that promote growth in their sectors, ensure consumer protection and maintain standard practice. Delivery of a Centralized monitoring platform: A unified platform for compliance monitoring and complaints management where all involved stakeholders have respective access rights to view and provide updates on work order statuses. Report submissions will be made across various channels i.e. Mobile App, USSD, Email, Call center and Web into the platform for resolution. 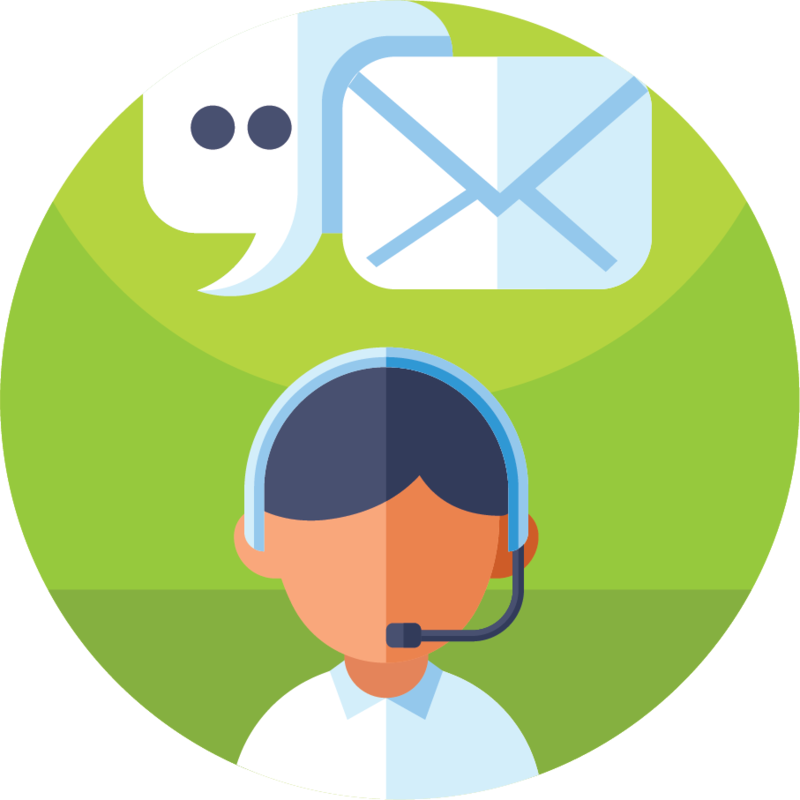 Improved efficiency and Visibility The application aggregates customer complaints from various sources, hence reducing time spent on going through the various platforms for complaint lodging and handling. It will reduce the time lost in sorting through bulky paperwork and emails. Provision of a real-time Reports Dashboard: An automated detailed reporting system for will aid the measurement of the compliance of the regulated institutions with issued regulations on consumer protection. With the advancements in technology, the manual process of assessing taxpayers is inefficient and leaves room to manipulation and by-pass hence Inland revenue services require the automation of the entire taxation spectrum in order to achieve the goal of increasing internally generated revenue. Crown Interactive Ltd was contracted as a revenue service provider for Edo State Inland Revenue Services to build a Direct Assessment Administration software that is cost effective and supports efficient operations, whilst ensuring the application of cutting-edge technology. The CICOD Direct Assessment System built for Edo State Internal Revenue Service is aggregated into Edo state’s single repository data management system which houses all profiled taxpayers in the state. As a result of the synchronization with the Single repository data management system, the self-assessment software is able to extract all enumerated and reconcile data of taxpayers that fall under the direct assessment category. The Direct Assessment system allows the filing of earnings record of Taxpayers for the tax year. The system then calculates tax reliefs due to the taxpayer prior to generating an assessment bill for the taxpayers based on the personal income fee administration stated by law. The system also allows the state levy taxes based on their own ‘best of judgement’ assessment (BOJ). As a result of the synchronization, CICOD’s direct assessment system sends the assessment bill to the single repository system which then issues the tax bill to the taxpayer and it receives a report when a settlement is made against an assessment. The automation of the Direct assessment processes and synchronization with the Repository Data Management System has enabled Edo State achieve its goal of creating a single taxpayer view across all revenue streams. This also has led to improved efficiency keeping taxpayers record, billing the taxpayers and most important has led to Increased revenue for the State. The Synchronization of the Direct Assessment with EIRS Reference Data Management System also for the extraction and reconciliation of Taxpayers records.